My personal definition of self-care has evolved over the years. I used to think that self-care was getting manicures, pedicures, and massages. I’ve since learned that it can be so much more. Before I share my personal definition however, I think it’s important to share some of my beliefs about self-care in general. Belief #1 - I believe everyone has a right to define what self-care means for themselves. If you search for the term “self-care” online you will find tons of articles, definitions, and resources to support your self-care. That said, I think it’s important for each person to reflect on and identify their own definition. Doing this will help you filter the information you find and best connect with the resources that are right for you. Belief #2 - Our definitions of self-care will grow/change overtime as we do. Just because something used to work to support your self-care, it doesn’t mean that the same thing will always work for you. We are ever changing and evolving beings. Each life experience, relationship, challenge and triumph comes together to shape the person you are in this moment. It is important to honor your growth by periodically assessing your self-care definition and adjust it according to what you need now. Belief #3 - There is no “wrong” or “right” way to support our self-care. The basic idea of self-care is to do things that support your care. There is no one in a better position than you to know what is or isn’t supportive — even if you need help sometimes to act on what you know. Nobody else can tell you that you’re doing self-care “right” or “wrong” or that their way is the “best” or “only” way to do it. You get to decide what is right for you, period. Belief #4 - Self-care matters because YOU matter. Self-care is important because you matter. You are a person of immense value. Who you are, your gifts and abilities, your dreams and desires. The impact you want to make in the world. All of this matters because you do. Self-Care: Learning to know, like, & trust yourself unconditionally; without guilt. I came to this definition as a result of my own personal growth and the work I’ve done with clients in my former counseling practice. I always understood the counseling process to be one of healing and growth. One that was focused on the journey and not the destination. As I partnered with my clients on their healing journeys, I noticed some patterns started to emerge. No matter the issue that brought clients to me, they all shared similar traits when they were nearing the end of their counseling process. They started liking and becoming more accepting of who they were. They starting hearing and trusting that small voice inside of them — trusting their “guts.” They became less apologetic about their needs and developed healthier boundaries in their relationships with others. Self-care changed from being activities they did once in awhile, to the way they thought about and supported themselves everyday. It helped them reshape their self-talk and act in ways that felt aligned with and accepting of all of who they were. It was also something that they could practice and grow over time, as their self-relationship matured. As I witnessed these transformations, my clients taught me that this is what a practice of self-care can look like. Not a destination, but a journey of growth and self-empowerment. It not only positioned them to become the best for themselves, but allowed them to best support the people in their lives. So does this mean there isn’t a place for a manicure or pedicure in our self-care practice? There is room for those things and so much more. I think of self-care as a practice because I believe there are tools we can use to develop our self-care muscles. The goal of our practice is not perfection. The goal is instead about intention, focus, and movement. Making choices that help us get to know, like, and trust ourselves a little bit more each day. I invite you spend a few moments now reflecting on your current definition of self-care. You may wish to simply think through the questions below, or pull out your journal so you can reflect on the page. Think about it in light of what you’ve read above and see what you notice. As you reflect I encourage you to do this from a space of non-judgement. Remember, you have a right and a responsibility to find a definition that is right for you now. 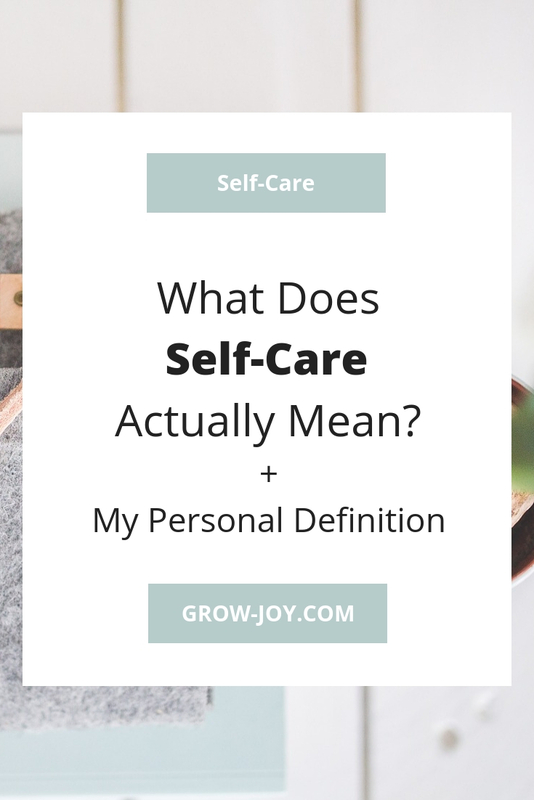 How do I currently define self-care? Who or what has influenced my understanding of self-care? Does my current understanding of self-care reflect who I am now? If not, how can I change it to be more supportive of the person I am today? Once you’ve finished your reflection, you may wish to set it aside for a day or two and then revisit it to see if there is anything you would add or change. I also invite you to share your reflections in the comments section below as I would love to know what you discovered. Wishing you more peace and joy than your heart can hold.